When we think of New England fall foliage, red maple trees certainly come immediately to mind. But sumac trees? Maybe not so much. A single majestic maple bears thousands of colorful fall leaves. By comparison, sumac is small; it's even considered by some to be a tall shrub. 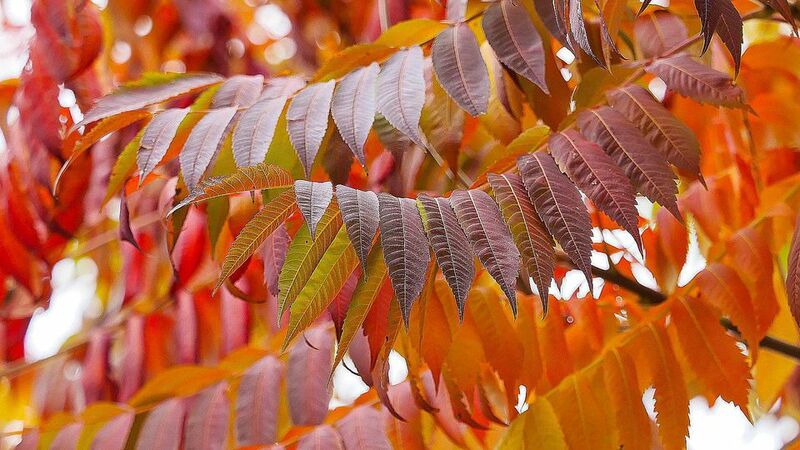 But, pound for pound (or perhaps that should be "leaf for leaf"), the sumac can hold its own with any tree for fall foliage. The reputation of these delightful plants, however, has been smeared through their association with their nefarious cousin, the poison sumac. Poison sumac is so dreaded that the mere mention of it will keep some people out of the woods, even during New England's brilliant fall foliage season. Poison sumac causes severe skin irritation when touched and indeed should be avoided, but that doesn't mean you should eradicate that stand of non-poison sumac trees on your property. Poison sumac has clusters of individual berries that hang down from small stems. The berries are somewhat flat, not perfectly round, and they are green in the summer and change to a whitish color in the fall. Non-poison sumac has seeds contained in tall, conical, fuzzy tufts that grow upright. The tufts are soft to the touch, and the tree's seeds are packed inside. In addition, poison sumac plants grow in swamps, whereas non-poison sumac plants prefer precisely the opposite habitat: soils that are well-drained. If you don't hang around swamps much, your chances of encountering poison sumac are pretty slim. It should be noted that while "non-poison" indicates an absence of skin irritation from contact with the plant, no part of the sumac plant should be ingested by anyone not thoroughly informed on the subject. There are many kinds of non-poison sumac trees. Two common varieties of wild sumac are native to New England. Staghorn trees (Rhus typhina (hirta)) are a relatively tall variety (reaching 18 to 35 feet). Staghorn derives its name from the hairy texture of its branches, reminiscent of the velvety feel of deer antlers. Another common wild variety is the smooth sumac tree (Rhus glabra), which grows height of about 10 feet. Both staghorn and smooth sumac provide striking fall foliage. If you have limited space for growing sumac, consider the Tiger Eyes shrub (Rhus typhina 'Bailtiger'). This cultivar of staghorn sumac is a dwarf, reaching a maximum of 6 feet tall and 6 feet wide. Its coloration is quite different from that of the wild sumacs. The lime-colored leaves are attractive enough, but the best show is reserved for fall, when the foliage picks up some hints of red or orange. While Tiger Eyes tends not to sucker as much as the staghorn type in some areas, be aware that there is no guarantee that it won't spread. So check first with your local county extension. Winter scenery with snow needs to be punctuated by color to hold our interest, and sumac's seed tufts are great for providing color. Best of all, the seed tufts remain on the sumac trees all winter, attracting colorful wild birds to stark landscapes. Indeed, sumac tree seeds are an important source of emergency food for birds throughout the winter and beyond. It's not uncommon to witness bluebirds, black-capped chickadees, and robins feeding on sumac seeds in early spring in New England when there is little else for them to eat. With so many good points in their favor, why are sumac trees thought of as "weeds" to be eradicated? This feeling generally stems from its aggressive growth. Like Japanese knotweed, sumac trees thrive on ground disturbed by humans. That is, it will grow even where you don't want it to grow in your yard. Sumac trees spread via rhizomes under the soil, as does Japanese knotweed. On land where the roots from trees long-since cut have decomposed in the soil, an open invitation exists for Japanese knotweed and sumac tree rhizomes to spread like crazy there, since impediments to their movement have been eliminated (they'll get plenty of sun too, which they both love). For this reason, both sumac trees and Japanese knotweed have been used in erosion control projects. But that's where the similarity ends. A stand of dead Japanese knotweed does nothing for winter scenery, as the ugly dried canes merely litter the landscape, whereas sumac contributes something positive to winter scenery. If you have only a small plot of land and wish to cultivate an extensive garden, and if you don't want to devote much time to restricting the spread of invasive plants, then growing sumac trees as an ornamental for its fall foliage and winter scenery potential is probably not for you. If you need to get rid of sumac trees, spray them with Ortho's Brush-B-Gon. Alternatively, you can cut the trunks and daub Roundup onto the stumps.